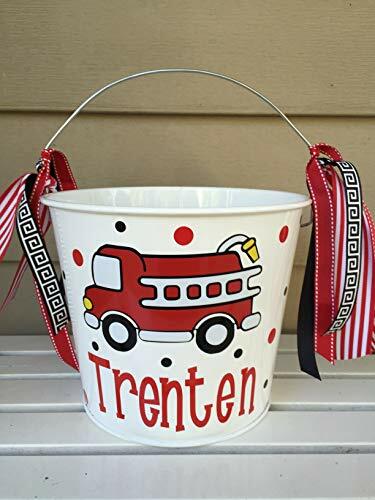 5 quart white metal bucket decorated with Fire Engine / Truck design, your child's name, polka dots and ribbon streamers. Perfect to match your child's costume. Pail is 7 inches tall, and 8 1/2 inches in diameter at the top. Choice of name color and polka dots. optional plastic lid available for additional $2. 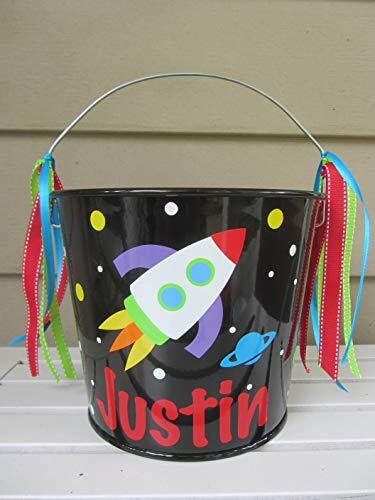 5 quart black metal bucket decorated with a rocket design, your child's name, polka dots and ribbon streamers. 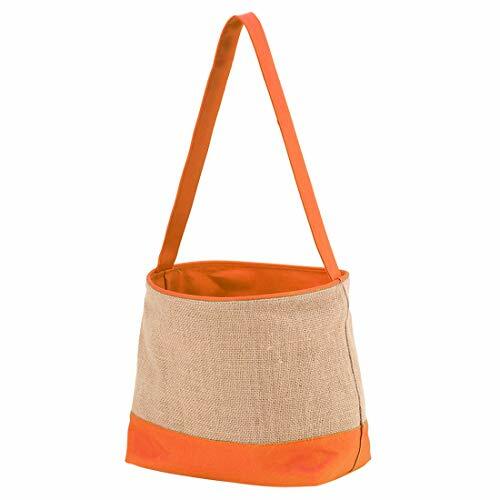 Pail is 7 inches tall, and 8 1/2 inches in diameter at the top. 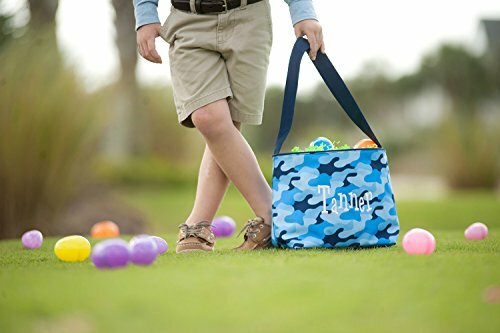 Choice of name colors and polka dots. optional plastic lid available for additional $2. 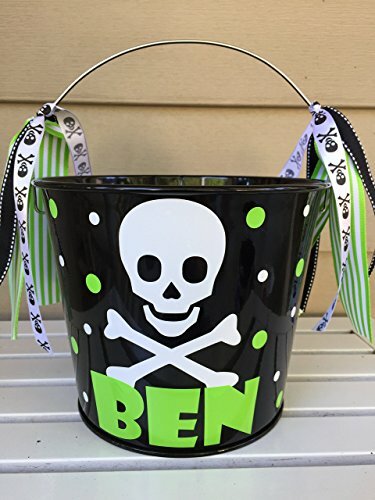 5 quart black metal bucket decorated with skull and crossbones design, your child's name, polka dots and ribbon streamers. Pail is 7 inches tall, and 8 1/2 inches in diameter at the top. Choice of name color and polka dots. optional plastic lid available for additional $2. 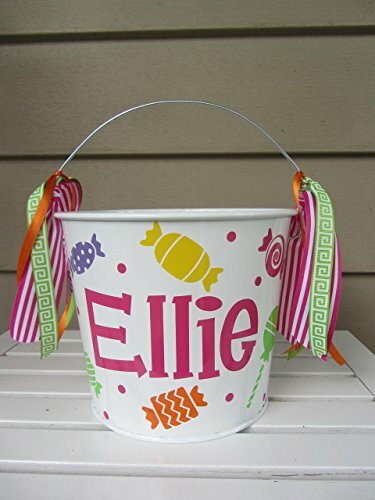 5 quart white metal bucket decorated with candy design, your child's name, polka dots and ribbon streamers. Perfect to match your child's costume. Pail is 7 inches tall, and 8 1/2 inches in diameter at the top. Choice of name color and polka dots. optional plastic lid available for additional $2. 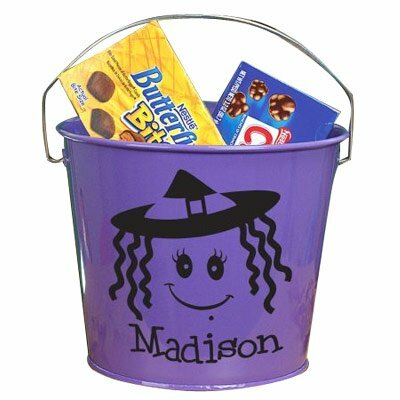 I added some some Halloween buckets with Graphics on them to show you the reason I removed the faces of the Trick or Treat Candy Buckets. I wanted to personalize them. Enjoy. I will add more pictures as I produce them. 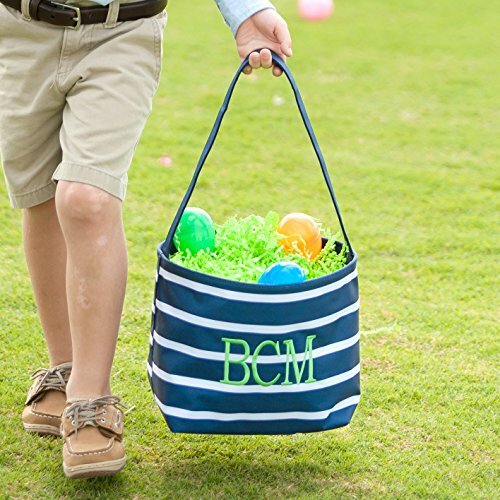 The regular buckets are $7.00 with one color graphic and name. $10.00 for the glow in the dark with one color design and name.